If global warming is real, why is it so cold this winter? SHORT ANSWER: These two need not always be in sync, because global warming represents a long term global trend while a specific day’s temperature refers to a short term phenomenon. While this sounds like a sensible question, in reality, such an argument is an example of missing the woods for the trees. Really? How is that so? The first step is to understand what global warming is REALLY about. You see, global warming is not about the temperature this year versus that of last year at a particular location. It is more about a long-term trend that considers changes in global temperatures over decades. This essentially means that the increases in temperatures we are talking about are measured over many decades! Secondly, the temperature that is considered to estimate global warming is the average global temperature, and not the temperature at a specific location alone. (Please see the post What is Global Warming? for more clarity). So, global warming is a measure of Global Average Temperatures Over Many Decades. To give you some estimates, the global warming in the past one hundred years has been estimated to be 0.75 degrees Celsius in surface temperature. In a hundred years, this global average has increased by just 0.75 deg C – and this small increase in itself is reportedly doing serious harm! All along these hundred years, some regions might have experienced colder winters in one year than those in the previous year, but the average global temperature has been increasing all along. And even if the average global temperature for a year is lower than that for the previous year, it is again perfectly possible to have increasing average long term trends – something that has been confirmed to happen for the past two hundred years. Let me end with an analogy. Let’s consider a professional athlete running 5 Kms two-three times a week, and who has been continuously trying to lower his running time, as any athlete does. Five years back (2012), the athlete’s annual average time, over 100 runs, was 23 min 20 seconds. Since then, it had been consistently improving (lesser time) year on year, and for 2017, let’s say he has been averaging 22 min 15 seconds. While the average has been constantly decreasing past five years, you will agree that it is still possible for him to have had a few bad days in 2017 when his timing went beyond 24 minutes during some runs. Similar is the case with our experiencing a few cold winters and average global warming trends. Day-to-day and season-to-season changes in weather patterns will continue to produce some unusually cold days and nights, and winters and summers. These isolated experiences do not negate the concept of global warming. So, the next time you have that niggling doubt about global warming on a bitter cold wintry day, remember the woods and the trees! 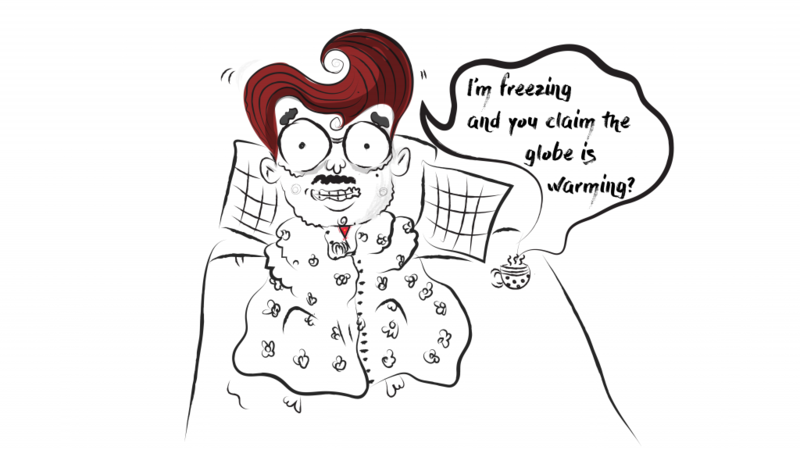 Here’s a nice, short video on why colder winters do not disprove global warming. « Isn’t there disagreement among scientists about the causes of global warming?